It wouldn't surprise Carolina Hurricanes coach Paul Maurice or General Manager Jim Rutherford if the Tampa Bay Lightning orchestrated the season's biggest turnaround. "You have your big boy there in Washington (Alex Ovechkin) and they should be the favorite in the Southeast, but I also think the Tampa Bay Lightning will be better," Maurice told NHL.com. "They had so many things go wrong last year with the coaching change and those injuries on the back end. Your just can't win in this League if your back end is beat up consistently. I think they will be much improved." Maurice also was quick to point out that the Florida Panthers, despite the departure of All-Star defenseman Jay Bouwmeester, will also be in the playoff hunt. "Coach Peter DeBoer did a spectacular job last year and just missed the playoffs," Maurice said. "He'll find a way to get those guys to play and play well." Rutherford, who admits his players and coaching staff entered the season extremely confident, offered this assessment of the Southeast Division. "We're not going to concede the division to anybody, but I think teams have to be careful that you don't leave it all out there trying to win your division when really what you have to do is be one of the eight that gets in and be ready to go when the playoffs start," Rutherford said. "I like Washington's team, but these other teams have improved. I think Tampa will be one of the most improved teams in the League this year. They sorted through some things and have made some nice changes, as did Atlanta, so our division should be pretty good." It was a little over two months into his second tour of duty as head coach of the Carolina Hurricanes that Paul Maurice began to sense a collective turnaround. 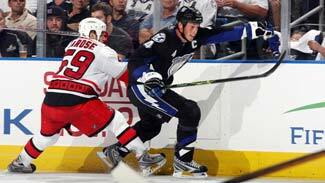 Maurice said it came after consecutive losses to Florida, 5-0, and Columbus, 5-1, in mid-February of last season. "It wasn't good," Maurice told NHL.com. "You can talk about systems and you can talk about all those things, but we weren't working hard enough. At the end of the day, we just were not competing the way we needed to." There also was the issue of wanting to win so badly players actually would turn away from their assigned roles and "cheat" in order to make something happen. "Players were hanging, their shifts were too long and there wasn't enough back-checking," Maurice said. "In order to be successful, you have to do those ugly things, too. Once we started to do that, we were a good team." Once Carolina believed in what Maurice was trying to accomplish, the club took off to finish the regular season 33-19-5. Not only did the 'Canes earn their first playoff berth in three seasons, but made their first Eastern Conference Finals appearance since winning the Stanley Cup in 2006. "Paul has the ability to pick out what's not going right and deal with it sooner than later," Carolina General Manager Jim Rutherford told the team's Web site. "Some coaches just know how to coach a certain way. Coaches like Paul are willing to adapt and to make changes. That's why he was with the Hurricanes as long as he was and that's why he's going to be one of those few coaches in the NHL who is going to win 500 games." Entering the 2009-10 season, Maurice has won 377 games in 12 seasons, which includes stints in Hartford and Toronto. His club stunned the New Jersey Devils and Boston Bruins in back-to-back, seven-game series during the 2009 postseason before falling in four games by the Pittsburgh Penguins in the conference final. "New Jersey beat the hell out of us in Game 1 of our playoff series with them (a 4-1 loss), but when you can manage and make adjustments as we did, that's when things can get turned around," Maurice said. It was quite a run last season, but what challenge does Maurice face in getting his team back to the conference final and beyond, in 2009-10? "Coaches like Paul are willing to adapt and to make changes. That's why he was with the Hurricanes as long as he was and that's why he's going to be one of those few coaches in the NHL who is going to win 500 games." "Our biggest challenge will be remembering how difficult it was to make the playoffs, and in doing that we've added some veteran depth to our team, so now we have to make sure everyone is getting on the ice and feeling good about it," Maurice said. "We feel we're at our best when we're accepting who we are as a hockey team. It's a hard game of skate-skate-skate and that's the challenge because you have to get into the fight early with our team -- we can't wait until January to do it because it's taxing. Getting out of the gate early and getting ready for the fight will be the key for us." Rutherford made every attempt to create a bigger and stronger unit in front of fifth-year goalie Cam Ward. He signed, among others, defensemen Andrew Alberts (6-foot-5, 218 pounds), Aaron Ward (6-2, 209) and Jay Harrison (6-4, 211) in the offseason. "I feel good about our team; maybe as good as I felt about any team entering training camp since I've had this job," Rutherford told NHL.com. "We have a really good core of players who got us to the conference finals last season. One of our biggest needs, we felt, was getting bigger and stronger and when you look at the players we added -- (Tom) Kostopoulos, Ward, Alberts -- that's what we'll need during the long haul of the playoffs."